After watching Martha's cupcake week I was inspired to create a new cupcake for Alex. He really loves cinnamon and I saw that one of the Trophy Cupcakes flavors was snickerdoodle. Of course with the real butter and milk in their cupcakes and the fact that their shop is are over two thousand miles from our home, we aren't going to be eating any of their cupcakes anytime soon. 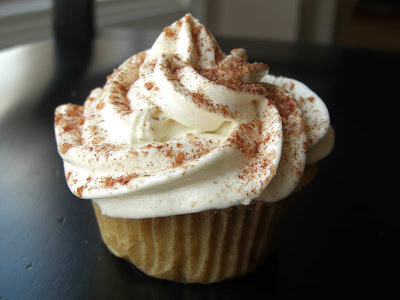 So I added a little orange extract to a favorite vanilla cupcake recipe and swirled in cinnamon sugar paste. Then I made a simple vanilla frosting and topped it with more cinnamon sugar for sparkle. These are vegan, dairy-free and egg-free. They taste awesome and make the house smell amazing. I think I might try topping them with crumble topping and serving them as muffins too. Thanks to Vegan Cupcakes Take Over the World for the recipe I adapted to make these. -Preheat oven to 350 degrees F. Line a cupcake pan with paper liners. -Mix together soymilk and vinegar and set aside for 1-5 minutes. -In a large bowl, mix together flour, cornstarch, baking powder, baking soda, salt, and white sugar. -In a small bowl, mix together the cinnamon, brown sugar and 2 teaspoons of the vegetable oil. -Add remaining oil and the orange and vanilla extracts to the soured soymilk. Stir together and add to the dry ingredients. Mix together to form a smooth batter. Pour into the lined cupcake pan. -Spoon a heaping 1/2 teaspoon full of the cinnamon mixture into each cupcake. Make a zigzag with a bamboo stick or toothpick. -Bake for 19-22 minutes until a toothpick inserted in the center comes out clean. -Allow to cool and frost with vanilla frosting and sprinkle with cinnamon sugar. Frosting Notes: I rarely measure when I make vanilla frosting. I just take 1/2 cup of softened Earth Balance and 1 teaspoon of vanilla extract and beat it with enough sifted powdered sugar to get the right consistency and taste. If it gets too thick I thin it with a little soy milk. An Iron Chef Game for the Wii?